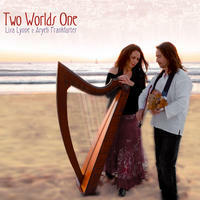 Aryeh Frankfurter and Lisa Lynne: Two worlds, one music. 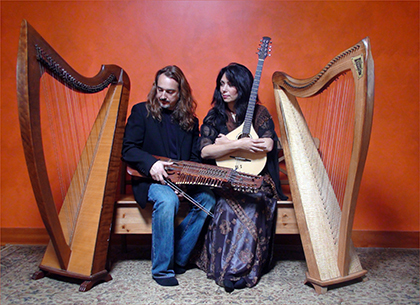 Aryeh Frankfurter and Lisa Lynne are a multi-instrumentalist duo with Celtic Harps, Swedish Nyckelharpa, Ukrainian Bandura, Citterns, Irish Bouzouki, viola, and more. Their performances have been enchanting audiences throughout the country with unique, music, both traditional and original, entwined with with humorous stories of their lives as professional musicians whose career spans several decades. The result has been described as breathtaking and always results in standing ovations and invitations to return. Aryeh Frankfurter's musical endeavors began at the age of three when he undertook classical training on the violin. His progress enabled him to study under various master violinists, including concert master of the Chicago Symphony, Harold Ayres. By the age of twelve Aryeh was already being accepted into various university level orchestras, including a Northridge College music program and accredited courses in the University of Southern California summer institutes held in Idyllwild, California. He participated both as a violinist and violist in a series of chamber music ensembles under the tutelage of internationally renown cellist, Bonnie Hampton, pianist Nathan Schwartz, teachers at the San Francisco Conservatory of Music, and the late violinist Ann Crowden of the Crowden School of music in Berkeley, CA. From an early age Aryeh's musical development led him to explore various ethnic and international musical genres, particularly Celtic folk music. At the age of fifteen, Aryeh was introduced to the Celtic harp, an instrument which then become the focal point of his musical inspiration and expression. Over the interceding years Aryeh taught himself to play a variety of instruments including electric violin, viola, cello, guitar, cittern, mandolin, lap dulcimer and hammered dulcimer, bowed and plucked psaltry, penny whistle, baroque flute, recorder, percussion. Since 2006, his main focal instrument has been the unusual Swedish Nyckelharpa or keyed fiddle. In 1994, after leaving a doctoral program in philosophy, Aryeh began his career as a recording and performance artist. As of 2013, he has well over several dozen albums on which he has been as a soloist or a primary musician and has been a contributor in composition, arrangement, performance and production of numerous others. He currently pursues a career as a full time freelance musician performing widely throughout the San Francisco/Bay Area region of California and abroad. While his main venues continue to be public engagements at various fairs and festivals throughout the State, his engagements have included performing privately for HRH Prince Charles and Camilla, Duchess of Cornwall to the CEOs of Bechtel Corporation. He has performed on major stages throughout the world and he had been tapped often by major talent agencies such as Boris Goldmund, TEC Entertainment, and Bayside Distribution among many others. He has performed in countless concerts large and small, including a seated audience of 3400 in the outdoor amphitheater Dalhalla in Sweden where he shared the stage with the likes of Boys of the Lough and Dervish in 2001. Other notable appearances have included, Harpcon 2000 held in Monterey, California as well as Montana, Sylvia Wood's Harp Center in 2006, and the Dusty Strings in 2005. He has performed internationally in Sweden's oldest and largest music festival Musik Vid Siljan and impromptu performances at the Falun Musical Festival in the summer of 1996 and performed for the Bay Area Annual Festival of Harps in 2003, 2005 and 2006. He has performed on numerous stages with such notably acclaimed musicians as Lisa Lynne, Patrick Ball and Windham Hill artists, Barbara Higbie and Liz Story. His music has been heard national and internationally, and he has been a featured artist on the PRI syndicated radio program Echoes (PRI) on which his album made it to #4 on the radio charts. In addition to his career as a Celtic harper, Aryeh has explored a wide range of musical styles utilizing all his multi-instrumental capabilities. He has collaborated with a wide variety of musicians and music producers from the progressive rock and roll band with Patrick Ball, Lisa Lynne, Jon Anderson of Yes fame, film and TV soundtrack composer Jame Dunlap, Azigza, Medieval Sephardic Musician Lauren Pomerantz, modern Rai singer MC Rai, the psychedelic space-rock peformance artist Gilli Smythe,'Tribal Trance Druidic Dance' music of Land of the Blind, the harp pop-jazz stylings of Verlene Shermer to the Hip Hop/Rap albums produced by Million Dollar Dream to name just a few. Aryeh currently colloborates extensively with his partner and colleague, Windham Hill artist and Billboard Chart topping harpist and composer, Lisa Lynne. Primarily Aryeh is the father of his son, Abraham whose passion lies in the art of acting, music and literature. You can find out more about Aryeh on his 크레이지슬롯 사이트website. You can find out more about Lisa on her website. Aryeh Frankfurter and Lisa Lynne lives in California, USA. 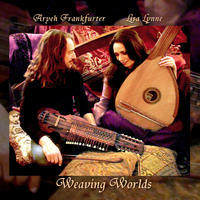 Tagged as: World, New Age, Harp.